Ahh, the first medical issue of our son. And by issue, I mean subtle annoyance for Liam. After a quick read through of Baby 411 and a visit to the Baby Center, our suspicions were confirmed: blocked tear duct. Unlike the English keeper, Robert Green, was able to do to American Clint Dempsey’s shot last Saturday, this duct is blocked. A funny, gooey–then crusty–substance forms near the eye. But a little warm cloth helps out and it doesn’t appear to sour Liam in the least. No need to consult Dr. Baas or Dr. Tyler at MarketPlace Vision…yet. Our guy spent his first night in his own room yesterday. That’s right, a full six hours cribbin’. Feed, poop, change, swaddle, nuk and sleep. Knock on wood, all is progressing nicely. Side Note: The little guy’s scalp still smells like holy oil from the baptism last Saturday. Tomorrow Morning: Liam will see you early tomorrow morning at Union Park Lounge for US-Slovenia World Cup action. Completely inappropriate, parental advisory, strong language…but downright hilarious video: Former MLB player Wally Backman is a minor league manager whose squad is the subject of a reality television show. Check out the footage of an encounter he has with an umpire. It is off the charts funny. Congrats Katie and Mike: Our pals Katie and Mike welcomed the beautiful Stella into the world a few days ago. Katie, the head volleyball coach at UIC, can only be salivating over the birth of another future all-american. -Liam squirms his way into the Catholic Church. 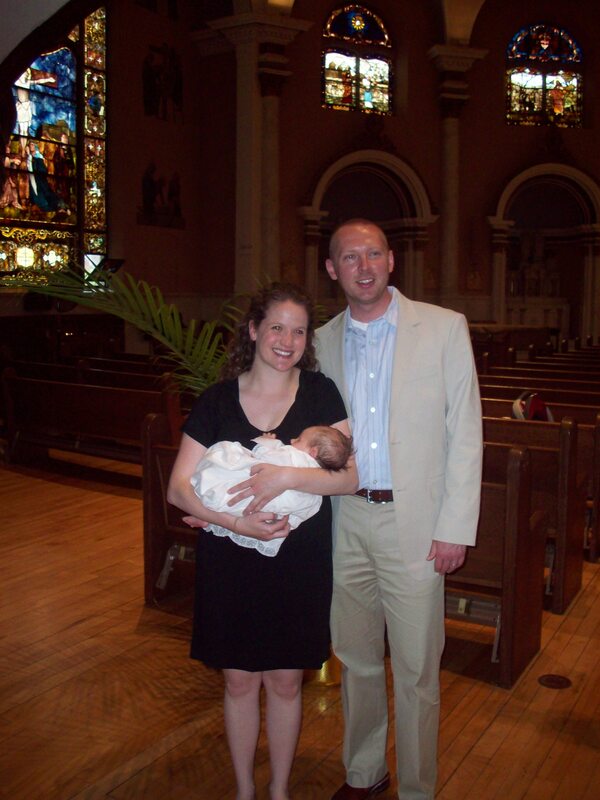 A short and sweet ceremony welcomed Liam into the Catholic faith Saturday. Family joined us at Palace del SulliParents post-church with Connie’s breakfast pizza making everyone feel better about the cramped environment. In addition, solid desserts were provided by family members along with a surprisingly fair-priced and tasty cake from Bake for Me. I recommend it. Liam still smells like Holy Oil. Father Andre really made sure he had enough, even mohawking his hair with it. -USA finishes level with England. 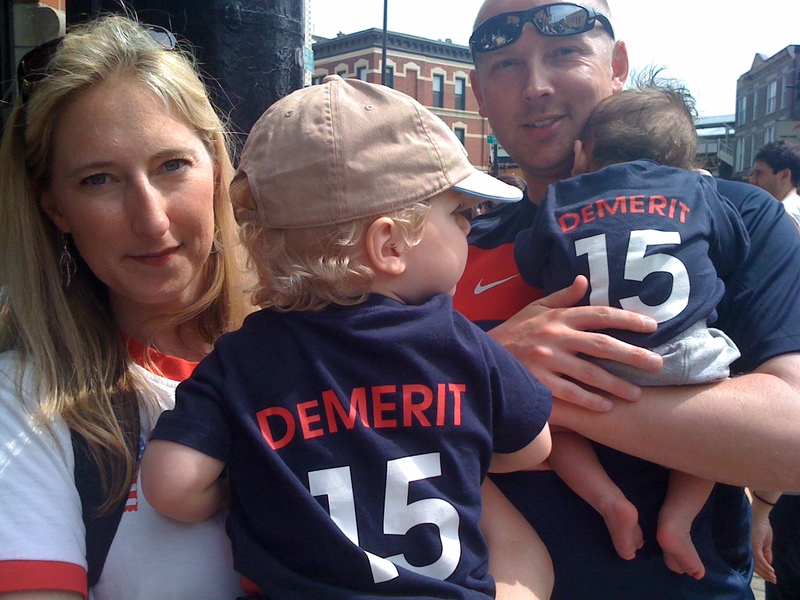 Liam and Joseph sporting sweet DeMerit, USA apparel. Hi Allison! 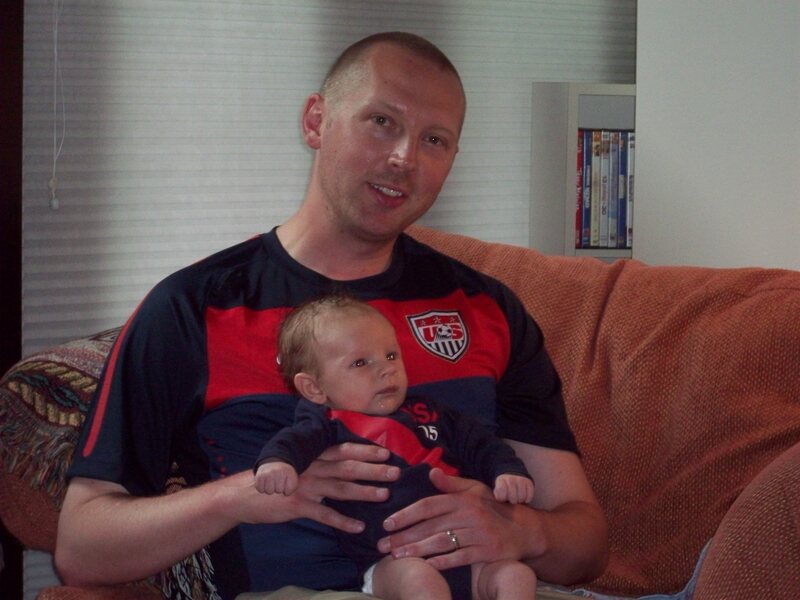 Liam and I changed into our stars and stripes gear for the greatly anticipated USA-England World Cup match following the holy festivities. 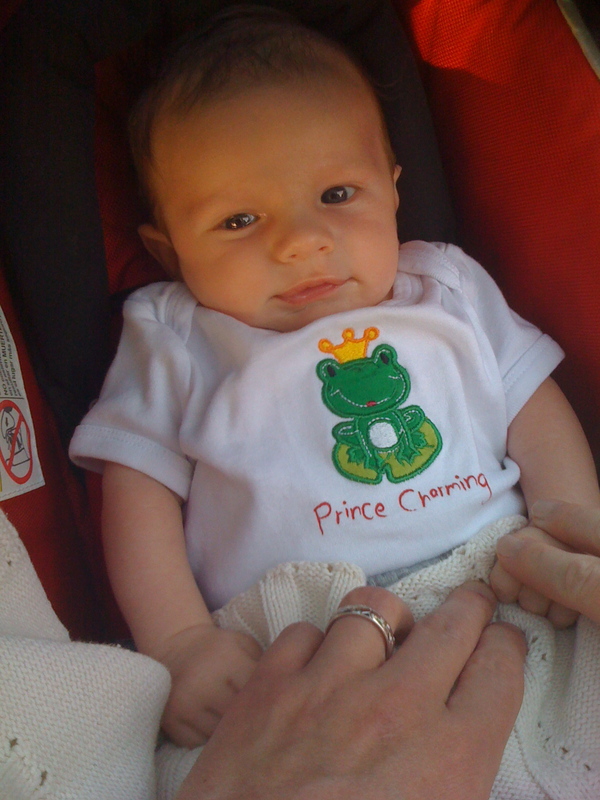 Liam was sporting his T-Shirt Deli produced and dad-designed Jay DeMerit onesie. Following an intriguing first half which saw a quick strike by the Three Lions followed by a Clint Dempsey strike on which the English goalie couldn’t find the horns, we made our way to Tavern in Wicker Park for the final 45. We were denied entry as children were not allowed. But we found a perfect window to view the match and enjoyed the atmosphere. A good result for the USA as Jay was superb for the US. We’ll see you Friday morning for the UIC Watch Party at Union Park. -SulliDad announces US Women’s Triathlon Series-Naperville. I always enjoy my announcing gigs and this one was no different. It was very cool to see all these women–2,000 in total–accomplish their goal. 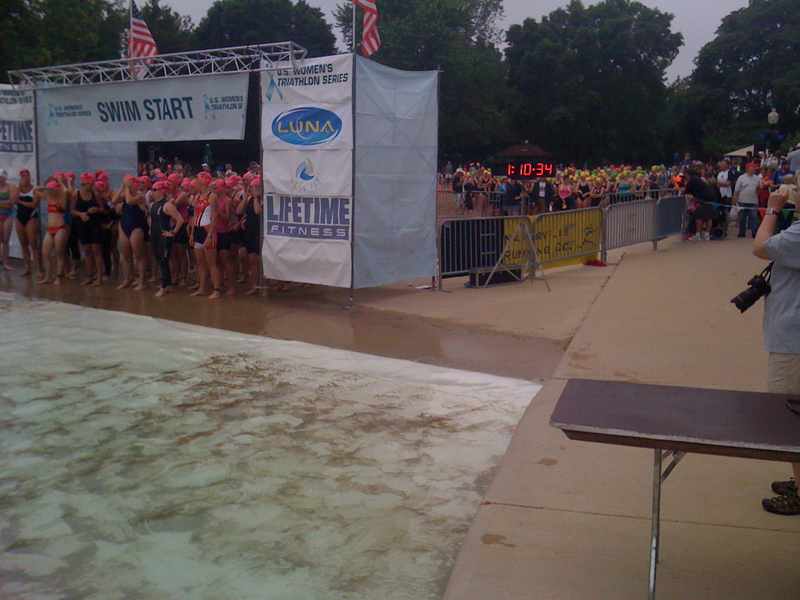 My view while announcing the Tri. 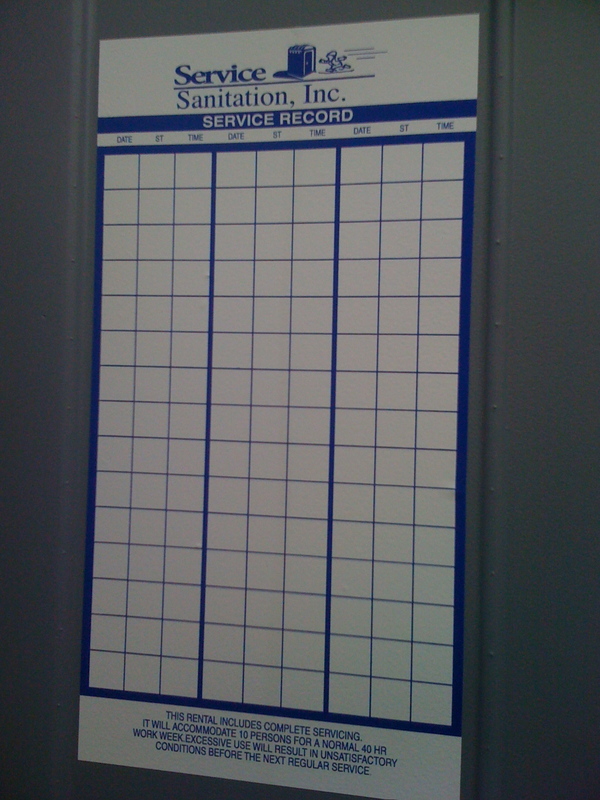 But, I did use a portolet and it appears it had never been serviced…yummy. Many who know me realize that I possess a significant amount of school pride for my collegiate alma mater, UIC. Working at UIC, points of pride come across my desk all the time. Students earning an internship or job offer after a letter of recommendation, teams winning titles, GPA’s soaring, personal bests being surpassed, etc. I’m on a campus committee for a special faculty/staff award and at our meeting today the depth of nominees discussed made me proud to be a member of the UIC community. But there’s something especially cool about the announcement from U.S. Soccer today that confirmed that Jay DeMerit is one of the 23 men who will represent our country in the FIFA World Cup. (He’s also feeling the heat from the British tabloids for talking about the American’s upcoming tournament opener with England) Jay played at UIC while I was running for the Flames. His journey to the top of the soccer world is an epic and tantalizing novel. (Take a moment and read about it; very cool story) We remain in touch and although we’re not close, I simply feel proud of and impressed by his accomplishments. Our friend Pete Vina is traveling to Philadelphia to help send-off Sam’s Army and man it would be sweet to join him there, not to mention to be in South Africa for the event. I look forward to visiting the T-Shirt Deli and picking up a customized USA, #15 onesie for Liam. I want the pride to rub off on the little guy. Plus, I’d like the lesson of perseverance to be learned early. Jay’s story defines that pretty well.